If you are looking for a romantic venue for a very special occasion, than look no further. YOu can rent a wagon at the Giant Ferris Wheel for EUR 250 per hour while enjoying not only a breathtaking view of the entire city but also a very special dinner served to 2 and more persons. For more info, call the following number: +43 1 729 5430-14 or visit the Vienna Tourist website at. This entry was posted in Touristy but worth it! 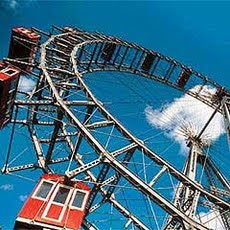 and tagged giant ferry wheel vienna, great view over vienna, romantic dinner, unique venue by admin. Bookmark the permalink.